Monoject needles are needle based safety devices that protect the healthcare worker from accidental needlestick injuries. The easy one handed design and robust safety shield of the Monoject Syringe ensures the clinician is protected against any exposures from sharps injury. Popular Monoject products include Monoject Insulin Syringes and Monoject Needles, part of the Monoject Kendall product family. 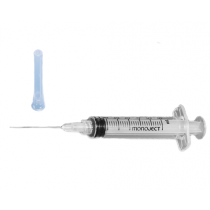 Make sure to check out our selection of Monoject Insulin Syringes as we have a large selection of Luer Lok syringes as well as SoftPack insulin syringes that are individually wrapped. Best of all, you'll receive Monoject Syringes and Needles at wholesale prices when purchasing with Vitality Medical. All Monoject products are a part the Kendall brand which is now part of Covidien. Monoject safety needles and syringe combinations are needle based safety devices preattached to syringes that protect the healthcare worker from accidental needlestick injuries. The preattached combinations of the Monoject Insulin Syringe save valuable nursing time and improve clinical efficiencies. The product is easy to use and the robust safety shield ensures clinicians, patients, and downstream workers receive unparalleled protection from a sharps injury when using a Monoject Kendall Syringe. After years of development, the Monoject insulin safety syringe emerges as an integral needle-based safety solution that improves clinician efficiency and maximizes protection. The Monoject safety syringes features bold unobstructed graduations, bevel orientation, and a robust safety shield that provides unparalleled protection during and after disposal. Popular Monoject products include Monoject Insulin Syringes and Monoject Needles, part of the Monoject Kendall product family. Make sure to check out our selection of Monoject Insulin Syringes as we have a large selection of Luer Lok syringes as well as SoftPack insulin syringes that are individually wrapped. Best of all, you'll receive Monoject Syringes and Needles at wholesale prices when purchasing with Vitality Medical.